WinTrillions ranks high up my list and is one great platform! On the surface, WinTrillions seems like any other online lottery site – and in many ways, it is. If you’ve ever played on lottery sites before, you will instantly feel at home here as the process is fairly similar to most of its ilk. They do standout in some key areas though, chief of which is their game variety. 20 lottery games, 12 regular syndicates, and millionaire raffles are all offered. WinTrillions also accepts over 32 payment methods – including Bitcoin. On top of that, WinTrillions also provides tight 256-bit SSL encryption technology for securing transactions, Return Path for filtering out spam, a money back guarantee, and even a mobile app. Unfortunately, they also stand out for a few wrong reasons: single draw purchases are nowhere in sight, their mobile app is Apple-exclusive, and subscriptions are automatically renewed. These missteps keep WinTrillions within inches from bagging the top spot; which is a shame, since they are among one of the better lottery sites in the industry. WinTrillions is an online lottery betting service that lets players bet on the outcomes of lotteries from all over the world. All winnings are paid out by WinTrillions directly, and will always match the amount of the official lotteries’. That means if you make a bet on the US Powerball for example – and you get all the winning numbers – WinTrillions will pay you the same amount as the official jackpot. Relatively expensive, compared to other similar services. 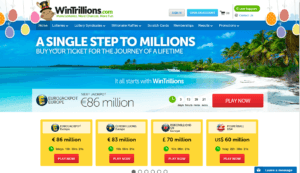 WinTrillions works similarly to other lottery betting sites like Lottoland. Players can bet on the official draws by choosing from the same range of numbers. In the case of a win, prizes will be paid out by WinTrillions. This comes directly out of the company’s revenues for smaller wins, while their insurance policies allow them to cover bigger jackpot prizes. For the most part, playing on WinTrillions feels just like participating in the official lottery. And compared to other lottery betting sites, WinTrillions is virtually the same. Except for one thing: WinTrillions automatically renews subscriptions until they’re cancelled. so it’s a bit more involved when it comes to managing your account. Personally? I don’t like it. The good news is that if you decide to cut your losses and move on, WinTrillions will refund the unused portion of your subscription, no questions asked. 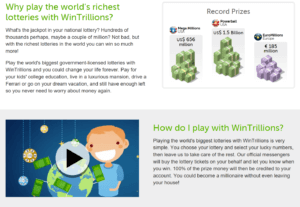 Not every lottery site offers a money back guarantee, so WinTrillions definitely earns top marks in this aspect. Signing up with WinTrillions is quick and easy. Although account creation at this site requires more personal details from you than the norm, it’s not like you’ll be filling up forms the whole day. It won’t take more than 5 minutes of your time. You can follow this link to sign up for WinTrillions. IMPORTANT NOTE: On the Country selection menu, one of the available options is United States. But just because WinTrillions allows US players to create an account doesn’t magically change gambling laws in your area. Always make sure that you are not breaking any laws before playing! Owned by Triangulum N.V., and founded in 2005, WinTrillions is regarded as one of the best online lottery sites in the industry. Currently, they serve over 480,000 customers that come from 118 countries around the globe. In addition, I think it’s important to note that the company diverts part of it revenues to help alleviate the poor living conditions of many communities in Latin America. They’re not the first online lottery to do charitable work, mind you – but that doesn’t mean it’s any less noble. From discounts to VIP points, WinTrillions offers a wide variety of promotions. You can, for example, get discounts via daily limited-time offers – these usually net you around 5-10% off for every entry. If you refer a friend to WinTrillions and they purchase tickets, you and your friend can earn free plays. The best part is you can keep referring as many friends as you can to keep earning free plays. If you’d rather not invite friends over to WinTrillions, you can still earn discounts and free plays by becoming part of their VIP Loyalty Program. Anyone who plays in WinTrillions automatically earns VIP points – just spend at least $2 on their website to get 1 VIP point. You can get $1 off any of your purhcases for 25 VIP points. A nice little addition to WinTrillions is the ability to send gift vouchers to any of your friends. These can be redeemed for subscriptions to any lottery, syndicate, or Millionaire Raffle on the Win Trillions website. You just have to provide the duration of the subscription and your friend’s email address. WinTrillions offers around 20 lottery games, but beware of higher ticket prices and automatic renewals. As previously mentioned, WinTrillions excels in offering a wide variety of games. In addition to popular games like EuroMillions, U.S. Powerball, Mega Millions, and the like, players are also offered less popular ones, as well. As you can see from the sample above, there’s a good mix of both popular and less popular games. They offer 12 syndicates (aka group play), which comprise of, but not limited to: Euro Combo, Power Combo, EuroMillions Max, EuroClub, Powerball, and more. 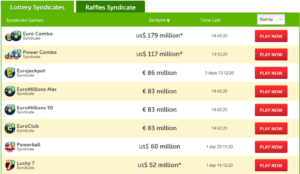 They also offer raffle syndicates, but because of the limited-time nature of millionaire raffles, some, if not all, raffle syndicates may become unavailable during certain times of the year. WinTrillions offers a good selection of Millionaire Raffles. Take note that some of these raffles change from time to time as a few are seasonal. [Update: 04/10/17]: While WinTrillions once offered several virtual scratch cards you can play, it seems they no longer offer this type of game. No. WinTrillions is a not a scam. The company has been around since 2005. That’s more than 10 years of certified, quality performance. While the company has seen changes in ownership (and even business models) over the years, WinTrillions has remained among the top names in the industry thanks to its outstanding customer service. In other words, you won’t have to worry about getting scammed of your money when you play with WinTrillions. Yes. WinTrillions is totally legitimate. They are also a licensed and regulated e-gaming entity, so you can be assured of your winnings. Yes. WinTrillions is serious about player security. WinTrillions employs 256-bit SSL encryption from GoDaddy — plus their systems are also tested externally by McAfee Secure daily. Meanwhile, every mail that comes from WinTrillions is monitored by Return Path, which helps curb spam. They comply with the strictest of anti-spam regulations so if you are tired of getting endless lottery spam mail, this is one of your best bets. Is WinTrillions a real or fake company? WinTrillions is a real company. They have been serving online lottery enthusiasts since 2005. WinTrillions is owned by Legacy Eight Curaçao NV. How does WinTrillions make money? Yes. WinTrillions’ operations are completely legal. If you’d like to use WinTrillions, be sure you are in a state/country that allows you to participate in online lottery betting. Does Lottery Critic trust WinTrillions? Yes. We at Lottery Critic trust WinTrillions 100%. 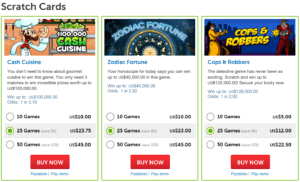 While they are not our favorite lottery betting site, they provide a secure and enjoyable gaming experience overall. Claiming your prize is very similar to other lottery sites’ processes. Prizes $600 or less are claimed on your behalf and automatically deposited to your account. Any prize amount that goes beyond that, meanwhile, is treated on a case-to-case basis. WinTrillions will contact you personally to assist you in claiming your prize. Also, if a certain lottery’s rules require winners to appear in person, then you would have no choice but to travel – even if it is to another country. It’s a small gripe that most online lottery players will have to deal with on almost every site, though. It’s just how some lotteries’ rules work. The good news is WinTrillions’ Winner Support Team will transfer the ticket to you and help make arrangements, so you can claim it in person. As for winning syndicates, the prize claiming process is similar – with one key difference. Prizes that amount to $600 or less will still automatically deposited to your account, but for prizes that go beyond that threshold, you might need to appear in person to collect prizes. At which point, your winnings may be automatically deposited to your account, given via cheque, or via bank transfer. Finally, it’s also important to note that WinTrillions does not take a cut from any of your winnings. Of course, local tax laws are a different story altogether. But, beyond that, all of your winnings go directly to you. WinTrillions makes it easy for you to claim your prizes, but you may have to appear in person for larger wins. When you do win, WinTrillions will immediately notify you – either via email and/or phone. Take note that you won’t get a call every time you win something; this is only reserved to winners whose prizes go above $600. One of the things that impressed me about WinTrillions is the sheer number of payment methods accepted. They accept the usual suspects like Visa, American Express and MasterCard. But if you don’t have these three credit cards, WinTrillions also accepts Skrill, JCB, AstroPay, Bitcoin and more. Has anyone won on WinTrillions? Enrique Gonzalez, then a 42-year old factory worker at Ecuador, nabbed the second-tier prize for Mega Millions – which meant he matched five of the winning numbers. Kate, a 42-year old American living in the UK, won the second place prize for the March 25, 2011 Mega Millions drawing. She matched five of the winning numbers 22, 24, 31, 52, 54 and 4. €125,000: An anonymous winner, going only by Richard, won the second prize for the December 22, 2016 Christmas El Gordo raffle draw. He invested €90 on a Decima, or one tenth of a full ticket book. 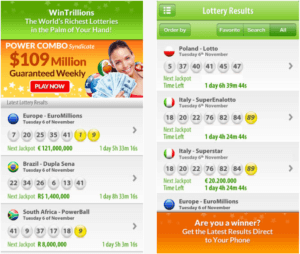 WinTrillions mobile app helps keep you connected to your lottery games anywhere and anytime. If your lifestyle takes you on the road often, you can download WinTrillions’ mobile app to get your lottery fix on-the-go. It lets you do just about anything that their full website does. It’s important to note, however, that their app is only available for Apple devices. If you are on Android, your only choice is to access their mobile-optimized website. For the most part, it gets the job done, but a dedicated mobile app would have been a marked improvement. WinTrillions’ customer support deserves praise. The Help section, for instance, is comprehensive enough to accommodate both new and veteran users. Aside from a detailed FAQ, the it also provides details for how their service or particular games work. They even discuss the most common lottery scams. If you need to escalate your concern to live support, you can call them by phone, email, live chat and an online contact form. Take note, however, that their live chat isn’t available 24/7—at certain times you can only leave a message. It’s a small gripe, but it’s a non-issue considering you can contact them via any of the other support channels. WinTrillions manages to pack as much useful information as they can into each lottery game page. I really liked how each lottery game page offered a mini-FAQ section that allowed me to learn a bit more about what EuroJackpot, for instance, is, how it works, and more. These allow you to absorb helpful information as you browse their website. WinTrillions’ website offers a simple, no-frills approach that feels pleasantly accessible. That said, let me be candid for a second – I’m not a big fan of WinTrillions’ website design. Don’t get me wrong; I’m not saying it’s terrible. I just don’t like how it looks. Something about it feels off, but I can’t put my finger on it. My nitpicking aside, WinTrillions’ website pretty much gets the job done as far as providing good user experience across the board. In short, simple and easy-to-use is the name of the game. Their landing page, for example, not only provides a quick peek at the latest lottery jackpots, but WinTrillions also took it upon themselves to sprinkle snippets of good-to-know information about their service. You can get brief overviews about how WinTrillions works, their money back guarantee, and more, just by visiting their home page. Beyond that, they also provide multi-language options. 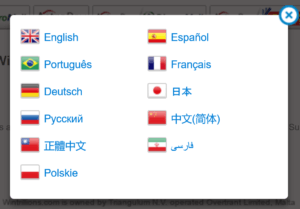 You can choose from 9 languages and switch between them on the fly. In addition to English, WinTrillions also comes in Spanish, Portuguese, French, Deutsch, Russian, Chinese, Taiwanese, and Polskie. 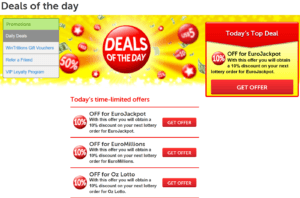 I found it very easy to start playing lotteries as it feels just like any other lottery site. After confirming your purchase order, WinTrillions will take care of the rest. On top of that, the company will also email you the results for every draw – regardless of whether you win or not. This way, you won’t have to keep checking their website or app for the results; simply wait, and results will come to you. Final Thoughts — Should You Use WinTrillions? Yes. It has some ways to go before realizing its full potential, but WinTrillions has a lot going for it right now. WinTrillions may not have an exhaustive list of lottery games like my top pick, theLotter, but the 20 they offer, plus the bevy of syndicates and raffles more than make up for it. They also offer tight security measures, zero commissions, a mobile app, a money back guarantee, and a good range of support options. They could have easily given theLotter a run for their money—but their various missteps prevent them from reaching their full potential. It’s annoying to be forced into multiple draws when I only want to participate in one; and it’s even more disheartening that subscriptions auto renew, even for the least number of consecutive draws. Then, there’s the fact that their mobile app is currently only for Apple users only; Android users will have to make do with a mobile-optimized website. It’s something, and it works for the most part, but a dedicated app would have been better. Still, WinTrillions is definitely worth a look as there are a lot of good things about it—just don’t expect them to match what theLotter offers. Hi Bonnie, thanks for your comment! Have you been using WinTrillion’s Syndicate programs?